In a color-coded map of Idaho’s geothermal activity, a striking swoop of bright-orange heat crosses through the southeastern part of the state. This is Idaho’s share of the Yellowstone Hot Spot, where hot rocks and magma flow beneath the surface of the Snake River Plain, making it one of the best identified sites in the country for geothermal energy production. But right now, Idaho is home to just one geothermal plant, a Raft River business owned by U.S. Geothermal. The University of Idaho and the Idaho National Laboratory (INL) — along with partners across the West — are looking to change that in a big way. “We see an opportunity for a number of these plants to be built in eastern Idaho to create an industry, to create an economic base and to create career opportunities for our students,” said Tom Wood, UI’s associate director for the Center for Advanced Energy Studies, or CAES. CAES is an Idaho Falls-based collaboration among INL, Idaho’s public universities and the University of Wyoming with the mission of educating the next generation of energy scientists, exploring energy and environmental research, applying that research to industry and enabling transitions in the energy market that lead to economic development. CAES is a partner in the Snake River Geothermal Consortium, one of five teams selected by the U.S. Department of Energy in April 2015 to participate in Phase 1 of the Frontier Observatory for Research in Geothermal Energy initiative — called FORGE for short. The CAES team believes southeastern Idaho is the perfect location for the FORGE site. 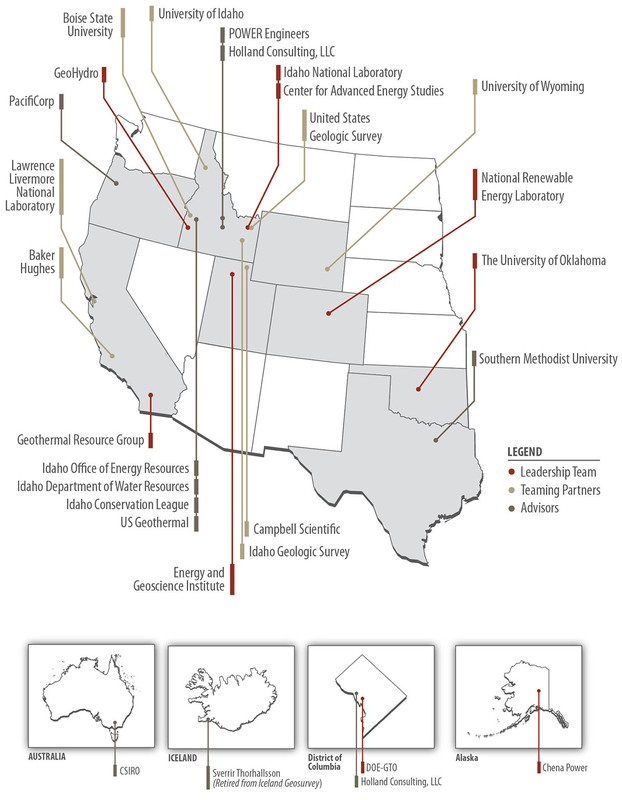 The Yellowstone Hot Spot swath includes most of INL’s campus, which has a 40-square-mile geothermal research and development site. The Geothermal Consortium will learn later this summer whether it has made it to Phase 2 of the competition, and the Department of Energy will select a final site in 2019. The FORGE initiative focuses on enhanced geothermal systems, which can reach deeper sources of heat than traditional geothermal plants and don’t use as much water. Because geothermal energy isn’t currently a big moneymaker, Wood explains, projects like FORGE are necessary to establish technologies, reduce industry and government investors’ risk, and open the door to a more widespread geothermal market. Researchers are studying ways to create fractures into which they can inject cold water and harvest hot water, as well as designing equipment that can withstand high temperatures. The INL site has a prolific aquifer to supply water, but the geothermal well’s target zone is deep enough that it will not damage the aquifer. “We’re trying to learn from the successes of the oil and gas industry, and learn from their mistakes,” Podgorney says. Whether or not Idaho receives the FORGE site, CAES and the Snake River Geothermal Consortium will continue pursuing geothermal energy technologies and bringing their economic benefits to Idaho. The combined research power of INL, the universities and their partners offers Idaho the chance for a geothermal renaissance, says Travis McLing, a senior scientist at INL who is studying toward his doctorate in geology at UI. The FORGE initiative and other geothermal research at CAES also benefits University of Idaho researchers and students, who in turn benefit the industry. If Idaho is selected as the final FORGE site, “there would be a lot of technology developed, a lot of patentable ideas, and opportunities for students and faculty to get involved in cutting-edge subsurface science,” Wood said. UI researchers are already involved in modeling the flows of heat and water in the Snake River Plain, and FORGE would open the door for extensive studies in topics from drilling to power-grid engineering to the social aspects of introducing a new energy market. UI students at CAES are working on projects such as using chemistry to understand the geothermal fingerprint of water hidden beneath cold-water aquifers, and using cutting-edge methods to revisit the geothermal potential of an area with known geothermal resources that previously eluded researchers. 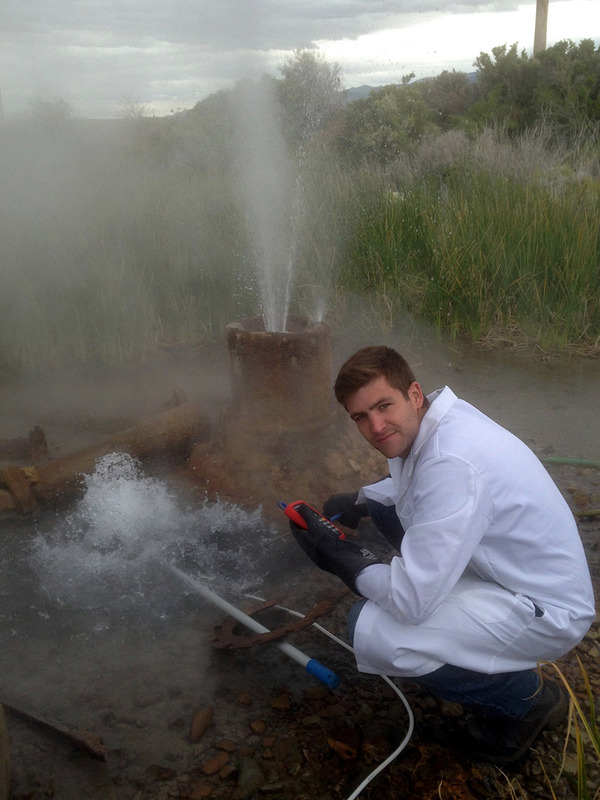 Involving students in geothermal research projects is important for the industry’s future. The last wave of intensive geothermal research in Idaho was in the 1970s and ’80s. CAES researchers recently met with retired engineers from this era to learn from their research and insights — but the next generation needs to get involved in this revolutionary industry. This story also appears in the Spring 2016 issue of Here We Have Idaho magazine. To read other stories, visit the Here We Have Idaho website. UI graduate student Cody Cannon works at the Greenhouse Well in Raft River Valley, Idaho. 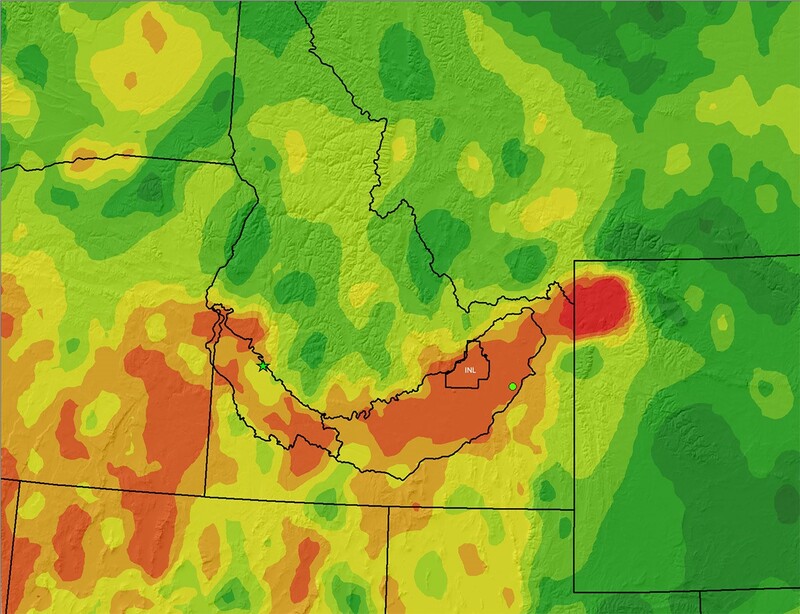 This hot spot map shows geothermically active areas in Idaho and the West. 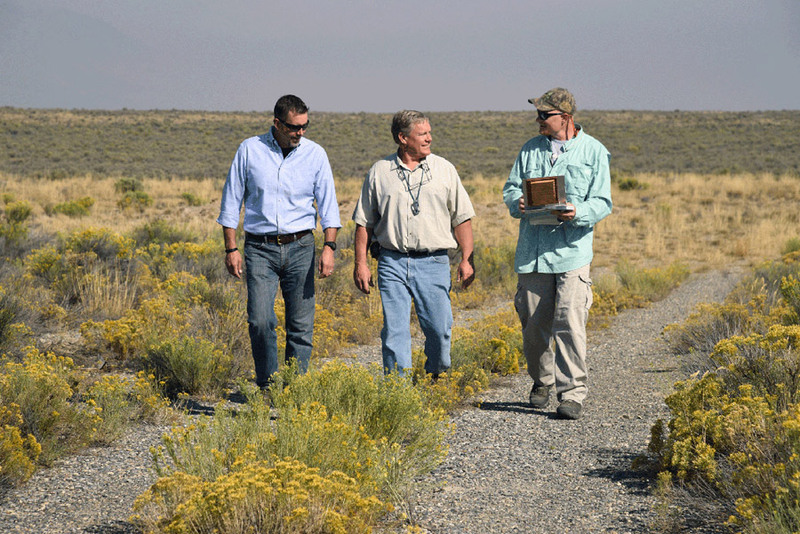 FORGE team members Rob Podgorney, INL (left), Tom Wood, UI (center), and Travis McLing, INL (right) visit INL’s Geothermal Resource Research Area at the INL site. This map shows members of the Snake River Geothermal Consortium FORGE team. Download the full 2016 Research Report in PDF format. UI, Idaho National Lab researchers aim for national geothermal research facility on Snake River Plain. Download the full 2015 Research Report in PDF format.